Today there are more networks and streaming services offering original programming than ever before. It is an amazing time for TV lovers and it seems that anyone can get pretty much anything on the air. With all these new shows debuting all over the place, this does unfortunately leave the networks at somewhat of a disadvantage when it comes to original ideas. 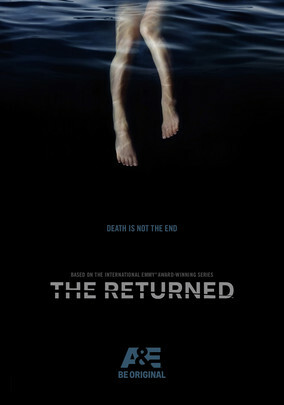 Out of desperation, many networks have turned to re-booting old shows, bringing back cancelled ideas that didin't work, and even Americanizing overseas television shows, The Returned is an example of the later. I understand why A&E chose to take a show from overseas, Americanize it, and market it as their next big hit, but why the Returned? This idea has been done to death, both in movies and on TV, and while the show is critically acclaimed, the ratings for the overseas version were terrible, the show was cancelled after it's second season. If no one is watching it over there, why did they think anyone would watch it over here? The returned takes place in a small Northwestern town, where one day, out of the blue, people who have been dead, some for decades, start showing up back at home with no memory of being gone at all. Each episode is broken up into sections that follow specific individuals and their interactions with their loved ones and society. There is also of course the police and investigative angle to the whole thing, and an unsolved crime thrown into the mix, in order to try and keep viewers coming back each week. Funny thing is, I wasn't all that crazy about this episode of the Twilight Zone. It was a little better when The X-Files did it. The 4400 added beings from the future and turned it into a series that quickly ran out of storyline and fizzled out, and now we have The Returned. This isn't an original idea, far from it, and the fact that it takes place in the same location as the 4400 is completely laughable. The cast has a few standouts that made the show a bit less tiresome, Mark Pellegrino is always fun to watch, as you never can figure out if he's a good guy or a bad one. We're also introduced to a new young actor in the form of Dylan Kingwell. He doesn't say much, but his character is honestly one of the most fascinating mysteries of the whole show. The bottom line is that this show is a complete rip off of other ideas and there is really very little here to keep the viewers interested. The boys story turned out to be really cool, The murder investigation was interesting but under utilized, and there were a few cast members I enjoyed. Otherwise the writing was terrible and parts of this show were just painfully slow. There are some terrific overseas shows that no one has even mentioned bringing over here, why they chose this one, I'll never know.